If you want to see owls on your property, erecting an owl house is a good start. While you might be lucky and get a new resident within a matter of days, it can take years for owls to move in. 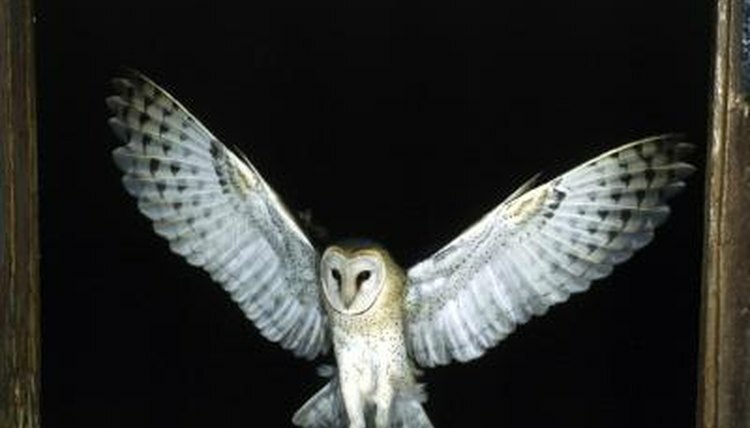 Making sure the conditions in your garden are conducive to owl living will encourage these nocturnal hunters. Where you place your owl house is extremely important. Affix it to a tall tree or wooden pole at least 10 to 15 feet off the ground. It can be facing in any direction except due north, as northerly winds can be extremely cold and may discourage owls from moving in. Don't place more than two houses for every 5 acres or so of land or there may not be enough food to attract these birds of prey. Also think about which kinds of owls you want to see on your land, as you can buy different kinds of owl houses to attract different species. If an owl doesn't move into your owl house swiftly, you might get some squatters. Other birds, such as starlings, or small mammals, such as squirrels, often make their homes in these nesting boxes. Regularly look out for signs of unwanted occupants, and remove any bedding material to encourage them to move out. If you don't have the heart to throw these critters out into the cold, you could simply place an additional owl house. If your garden doesn't have enough prey for an owl to hunt, he won't want to move in. You can encourage rodents onto your property in several ways and they will, in turn, attract owls. Rodents like to live among long grass, so put away the lawnmower. If you don't want to grow your entire lawn, just leave one or two patches of wilderness. Piles of brush will also be attractive to rodents. Owls prefer to live near a source of water. Although they get most of their water from their diet, they will bathe in it and occasionally drink it, particularly in warmer months. They prefer deeper water, so placing a large birdbath is ideal. Better still, put in a pond. Not only is it a water source, it may attract additional prey for owls, such as frogs and newts. What Animal Preys on Owls?